We will not halt the laying off of teachers and other public employees, the slashing of unemployment benefits, the closing of public libraries, the reduction of student loans, the foreclosures, the gutting of public education and early childhood programs or the dismantling of basic social services such as heating assistance for the elderly until we start to carry out sustained acts of civil disobedience against the financial institutions responsible for our debacle. The banks and Wall Street, which have erected the corporate state to serve their interests at our expense, caused the financial crisis. The bankers and their lobbyists crafted tax havens that account for up to $1 trillion in tax revenue lost every decade. They rewrote tax laws so the nation's most profitable corporations, including Bank of America, could avoid paying any federal taxes. They engaged in massive fraud and deception that wiped out an estimated $40 trillion in global wealth. The banks are the ones that should be made to pay for the financial collapse. Not us. And for this reason at 11 a.m. April 15 I will join protesters in Union Square in New York City in front of the Bank of America. "The political process no longer works," Kevin Zeese, the director of Prosperity Agenda and one of the organizers of the April 15 event, told me. "The economy is controlled by a handful of economic elites. The necessities of most Americans are no longer being met. The only way to change this is to shift the power to a culture of resistance. This will be the first in a series of events we will organize to help give people control of their economic and political life." If you are among the one in six workers in this country who does not have a job, if you are among the some 6-million people who have lost their homes to repossessions, if you are among the many hundreds of thousands of people who went bankrupt last year because they could not pay their medical bills or if you have simply had enough of the current kleptocracy, join us in Union Square Park for the "Sounds of Resistance Concert," which will feature political hip-hop/rock powerhouse Junkyard Empire with Broadcast Live and Sketch the Cataclysm. The organizers have set up a website, and there's more information on their Facebook page. We will picket the Union Square branch of Bank of America, one of the major financial institutions responsible for the theft of roughly $17 trillion in wages, savings and retirement benefits taken from ordinary citizens. We will build a miniature cardboard community that will include what we should have--good public libraries, free health clinics, banks that have been converted into credit unions, free and well-funded public schools and public universities, and shuttered recruiting centers (young men and women should not have to go to Iraq and Afghanistan as soldiers or Marines to find a job with health care). We will call for an end to all foreclosures and bank repossessions, a breaking up of the huge banking monopolies, a fair system of taxation and a government that is accountable to the people. The 10 major banks, which control 60 percent of the economy, determine how our legislative bills are written, how our courts rule, how we frame our public debates on the airwaves, who is elected to office and how we are governed. The phrase consent of the governed has been turned by our two major political parties into a cruel joke. There is no way to vote against the interests of Goldman Sachs. And the faster these banks and huge corporations are broken up and regulated, the sooner we will become free. Bank of America is one of the worst. It did not pay any federal taxes last year or the year before. It is currently one of the most aggressive banks in seizing homes, at times using private security teams that carry out brutal home invasions to toss families into the street. The bank refuses to lend small business people and consumers the billions in government money it was handed. It has returned with a vengeance to the flagrant criminal activity and speculation that created the meltdown, behavior made possible because the government refuses to institute effective sanctions or control from regulators, legislators or the courts. Bank of America, like most of the banks that peddled garbage to small shareholders, routinely hid its massive losses through a creative accounting device it called "repurchase agreements." It used these "repos" during the financial collapse to temporarily erase losses from the books by transferring toxic debt to dummy firms before public filings had to be made. It is called fraud. And Bank of America is very good at it. US Uncut, which will be involved in the April 15 demonstration in New York, carried out 50 protests outside Bank of America branches and offices on Feb. 26. UK Uncut, a British version of the group, produced this video guide to launching a "bail-in" in your neighborhood. Civil disobedience, such as that described in the bail-in video or the upcoming protest in Union Square, is the only tool we have left. A fourth of the country's largest corporations--including General Electric, ExxonMobil and Bank of America--paid no federal income taxes in 2010. But at the same time these corporations operate as if they have a divine right to hundreds of billions in taxpayer subsidies. 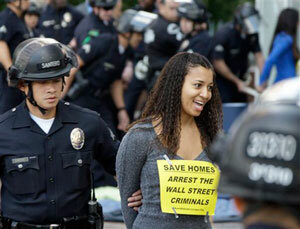 Bank of America was handed $45 billion--that is billion with a B--in federal bailout funds. Bank of America takes this money--money you and I paid in taxes--and hides it along with its profits in some 115 offshore accounts to avoid paying taxes. One assumes the bank's legions of accountants are busy making sure the corporation will not pay federal taxes again this year. Imagine if you or I tried that. "If Bank of America paid their fair share of taxes, planned cuts of $1.7 billion in early childhood education, including Head Start & Title 1, would not be needed," Zeese pointed out. "Bank of America avoids paying taxes by using subsidiaries in offshore tax havens. To eliminate their taxes, they reinvest proceeds overseas, instead of bringing the dollars home, thereby undermining the U.S. economy and avoiding federal taxes. Big Finance, like Bank of America, contributes to record deficits that are resulting in massive cuts to basic services in federal and state governments." The big banks and corporations are parasites. They greedily devour the entrails of the nation in a quest for profit, thrusting us all into serfdom and polluting and poisoning the ecosystem that sustains the human species. They have gobbled up more than a trillion dollars from the Department of Treasury and the Federal Reserve and created tiny enclaves of wealth and privilege where corporate managers replicate the decadence of the Forbidden City and Versailles. Those outside the gates, however, struggle to find work and watch helplessly as food and commodity prices rocket upward. The owners of one out of seven houses are now behind on their mortgage payments. In 2010 there were 3.8 million foreclosure filings and bank repossessions topped 2.8 million, a 2 percent increase over 2009 and a 23 percent increase over 2008. This record looks set to be broken in 2011. And no one in the Congress, the Obama White House, the courts or the press, all beholden to corporate money, will step in to stop or denounce the assault on families. Our ruling elite, including Barack Obama, are courtiers, shameless hedonists of power, who kneel before Wall Street and daily sell us out. The top corporate plutocrats are pulling down $900,000 an hour while one in four children depends on food stamps to eat. We don't need leaders. We don't need directives from above. We don't need formal organizations. We don't need to waste our time appealing to the Democratic Party or writing letters to the editor. We don't need more diatribes on the Internet. We need to physically get into the public square and create a mass movement. We need you and a few of your neighbors to begin it. We need you to walk down to your Bank of America branch and protest. We need you to come to Union Square. And once you do that you begin to create a force these elites always desperately try to snuff out -- resistance.